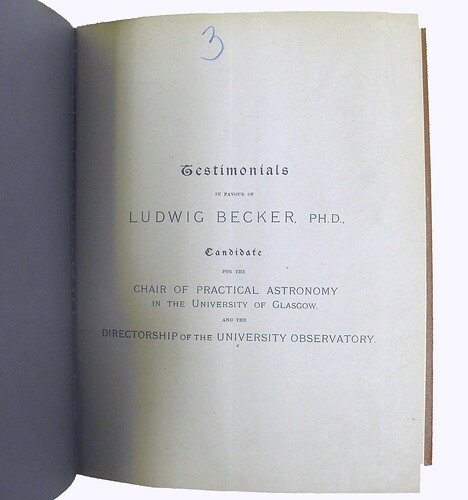 Ludwig Becker (1860-1947) succeeded Robert Grant as Professor of Astronomy, taking up the chair in 1893. These are the testimonials published in support of his candidature. Becker was born and educated in Bonn. He first came to Scotland in 1885 to work at Lord Crawford’s Observatory at Dunecht. He had been invited by the Astronomer Royal, Professor Copeland, who later provided one of the testimonials displayed here. Becker’s successor, William Smart, described him as an inspiring teacher who attracted large numbers of students. On top of his teaching, Becker did pioneering work in spectroscopy and oversaw a much-needed overhaul of the Observatory’s instruments. Despite having been naturalized as a British citizen, he was forced to retire to Aviemore for most of World War One because of the hostility towards him in Glasgow. But “whatever the outside world thought,” wrote Smart in an obituary, Becker was “respected and esteemed by his students both for his learning and kindly qualities.” Becker returned to his duties after the war, although by then visibility had so deteriorated at the Observatory that he was restricted to teaching and theoretical research. This copy is inscribed “To Lord Kelvin”, presumably from Becker himself, and was bound up with testimonials for numerous other candidates for university appointments for inclusion in Kelvin’s personal library.